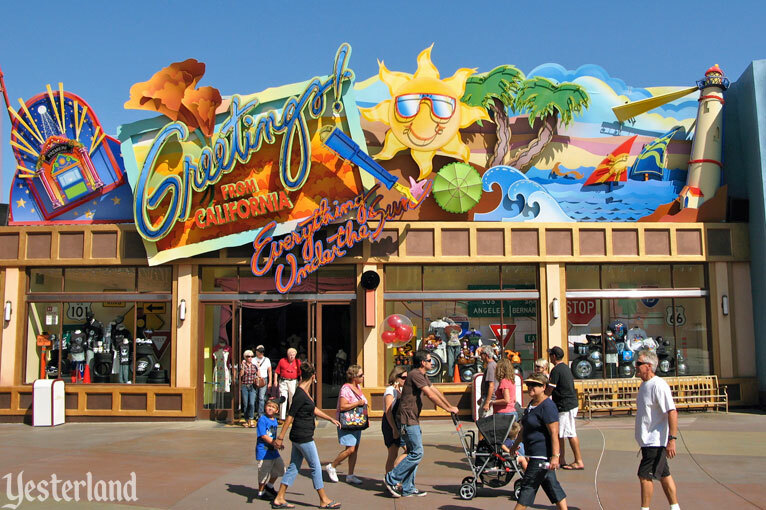 Greetings from California, where you can find everything under the sun, is the quintessential Disney’s California Adventure™ park shopping experience where Guests can discover souvenirs, mementos, and take home lots of Disney memories. 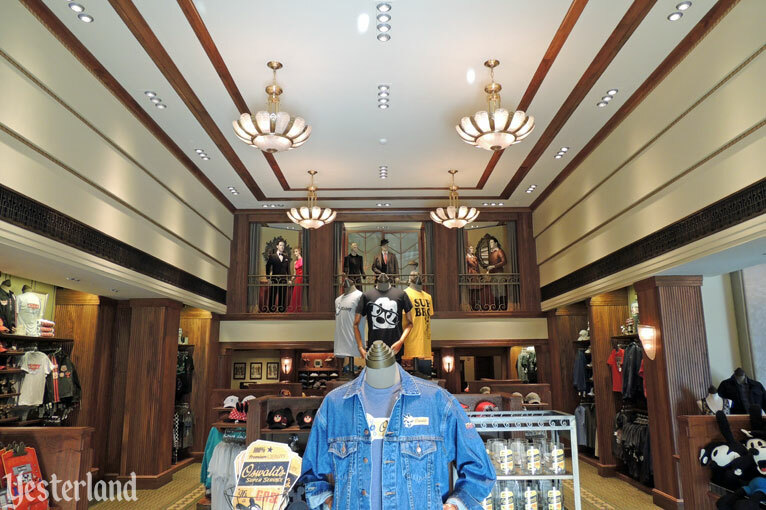 This store is so big that it has to have multiple entrances, each with its own personality. The front entrance is built into the largest ceramic mural in the World. The entrance on the other side of the park’s Golden Gate Bridge is flanked by large display windows. 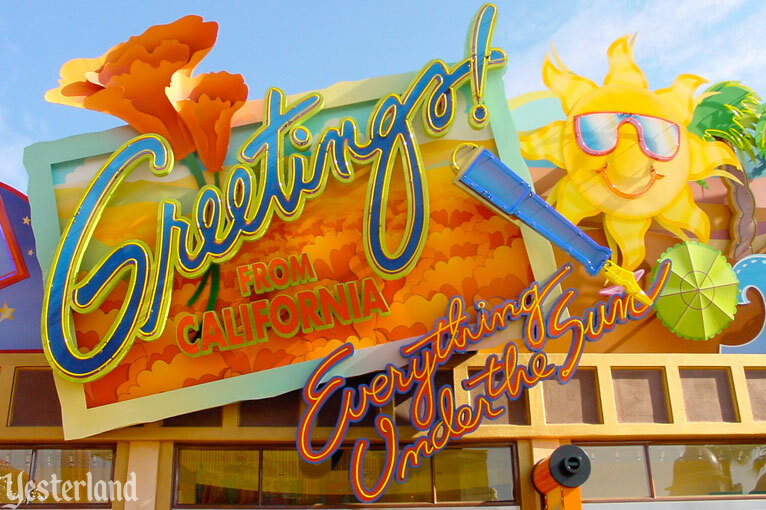 A huge sign carries forward the California postcard theme of the park entrance. There’s even a giant fountain pen on the sign. 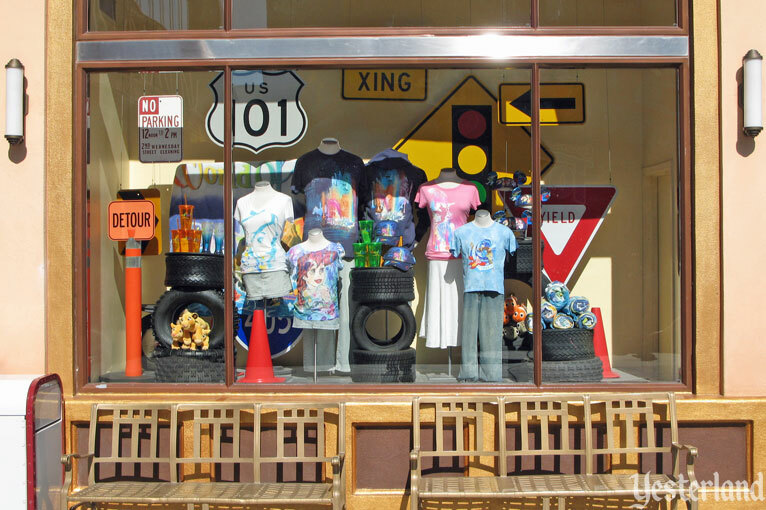 The display windows use tires and highway signs to convey the fun and excitement of traveling through the Golden State. 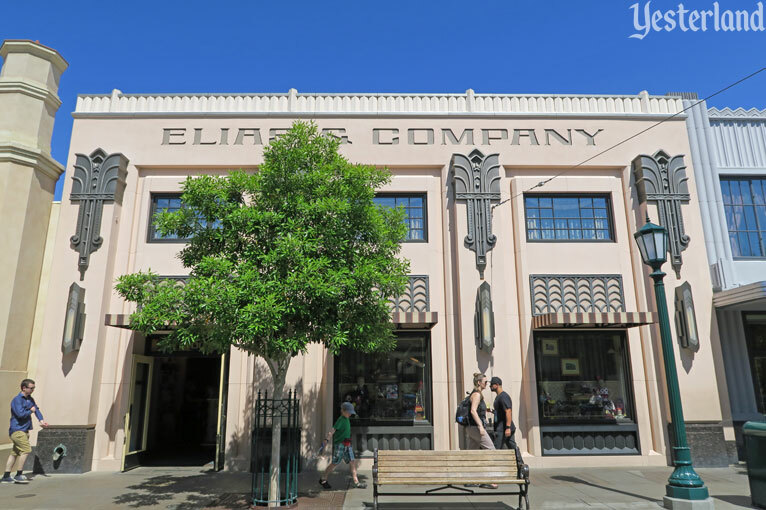 Around the corner from the side entrance, the corner entrance suggests the streamline moderne architecture of Los Angeles in the 1930s. Four double doors beckon you. There’s another entrance to the right. 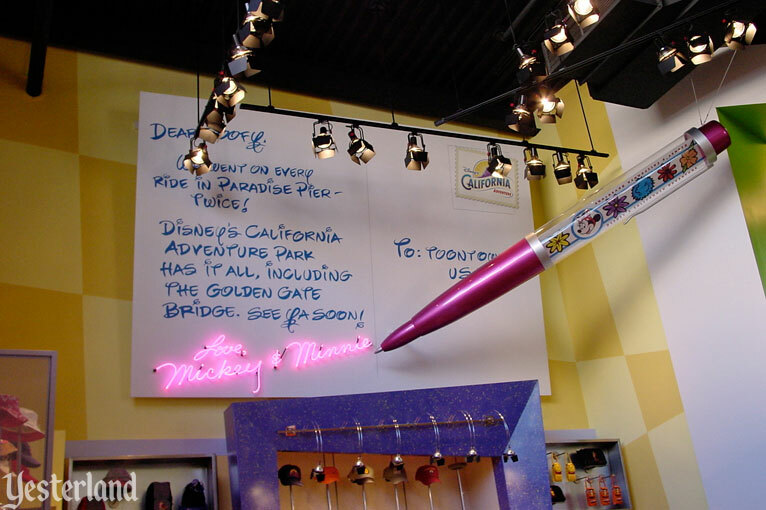 There’s still another into the Candy Shoppe, which you can think of as a separate store or as the candy section of Greetings from California. 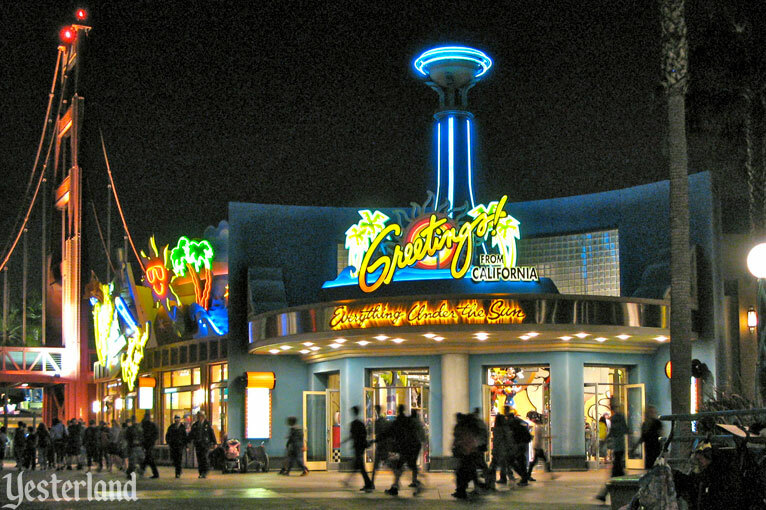 Atop the corner entrance, a tower with a sphere held by three pylons is reminiscent of the globe tower at Crossroads of the World on Sunset Blvd. in Hollywood. As homage to the past, the corner entrance is a bit clumsy, but that doesn’t matter. After all, Greetings from California is hip and contemporary. 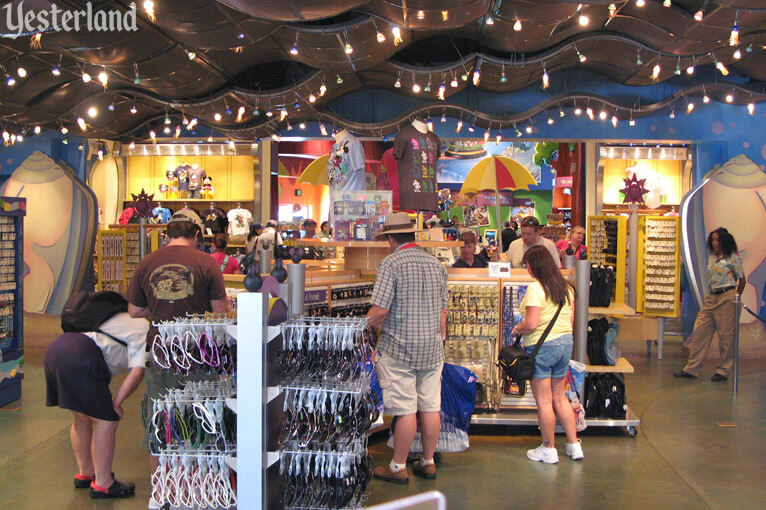 Guests who want an old-fashioned store should try a different theme park. You’ll see just how contemporary when you step inside the front entrance. Look up at the ceiling. 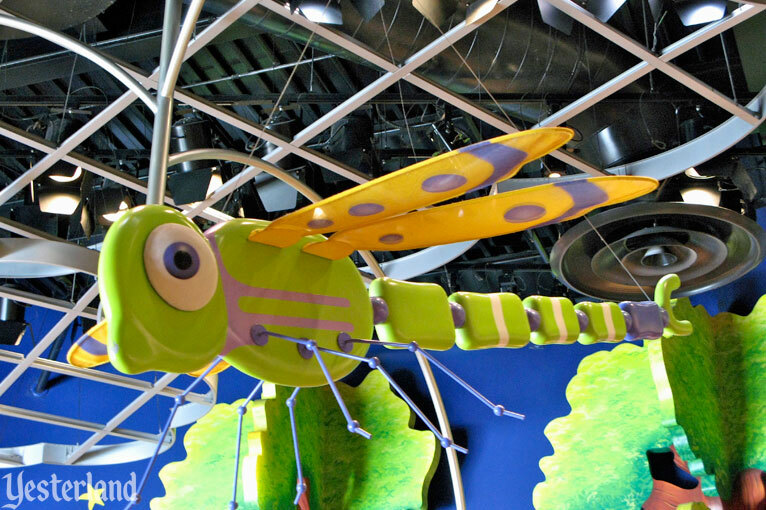 Above the giant hanging bugs, there’s exposed ductwork. This isn’t one of those theme park stores that’s supposed to make you feel as if you’ve traveled to another place and time. 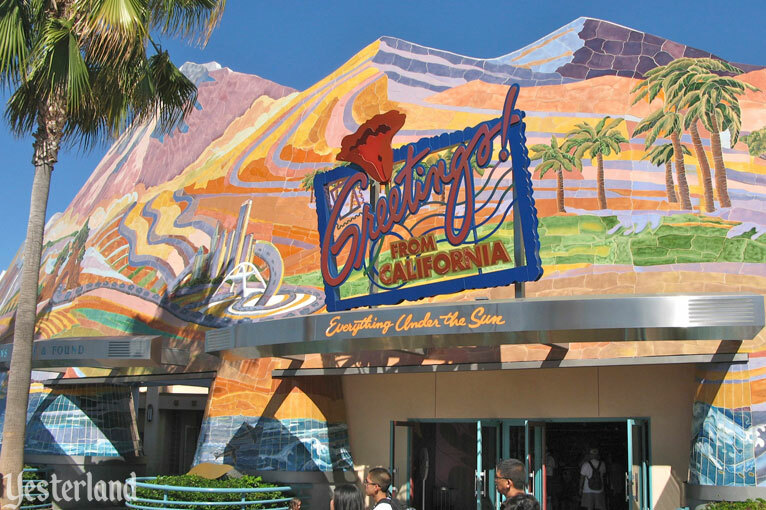 The place is here—the hip and edgy California Adventure park. And the time is now—the dawn of the new millennium. A lot of the merchandise here is similar to what you would find at the Disneyland Emporium—but the atmosphere is completely different. There are also some park-specific items. Continuing with the postcard theme of the park entrance and store signs, there’s a giant postcard to Goofy from Mickey and Minnie. It reminds their friend that the park even has the Golden Gate Bridge. A sign on the soffit promises “Memories Galore,” including memories of when cell phones had antennas and little, tiny displays. 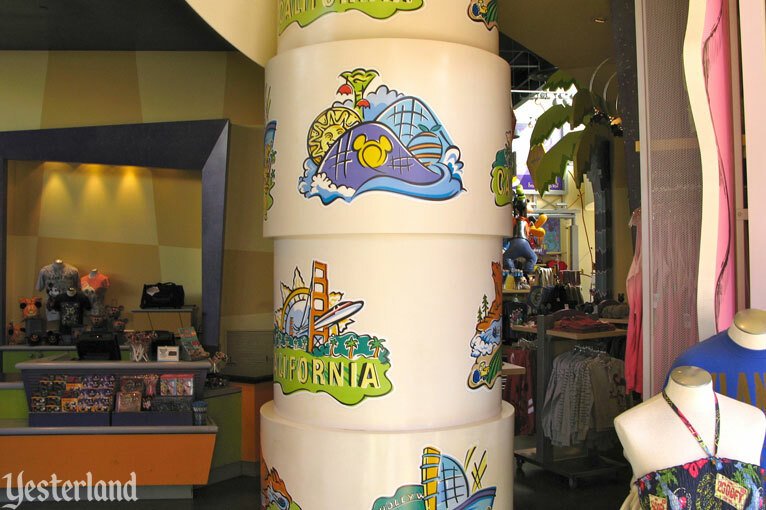 Park landmarks adorn a “ribbon” wrapped around a column. Look for the Sun Wheel, Orange Stinger, and Mickey Head on California Screamin’. Not only does this store sell “everything under the sun,” that could also describe the decor. 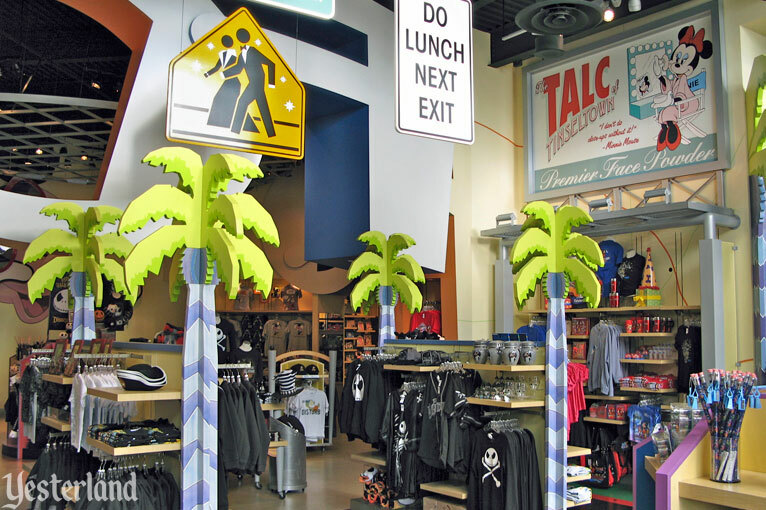 Among other things, there are stylized palm trees, realistic palm trees, pirate skeletons, road signs, and billboards. 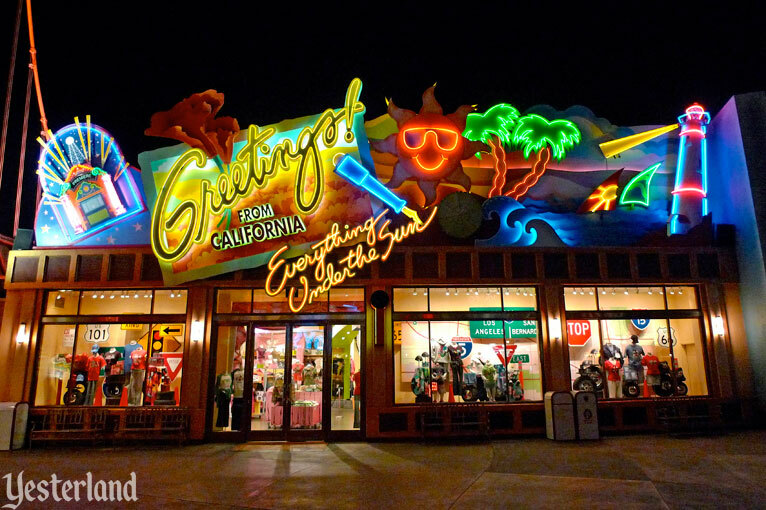 As is often the case with neon signs, Greetings from California looks best at night. Colorful neon tubes glow brightly in the darkness. Speaking of colorful lights at night, Disney’s Electrical Parade—not the Main Street Electrical Parade—passes outside Greetings from California every night. Don’t miss it. Then come back in and buy the t-shirt. 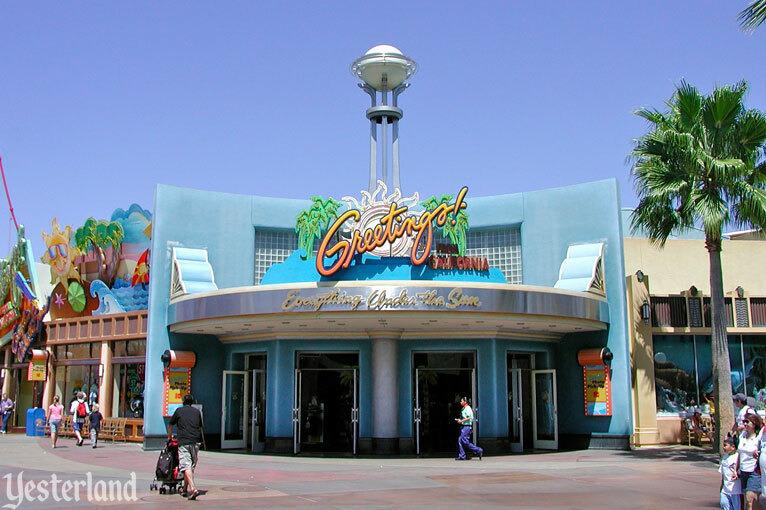 When Disney’s California Adventure opened in February 2001, Greetings from California was the park’s version of the Emporium at Disneyland—a large store on the right as guests headed for the exit after a day at the park. 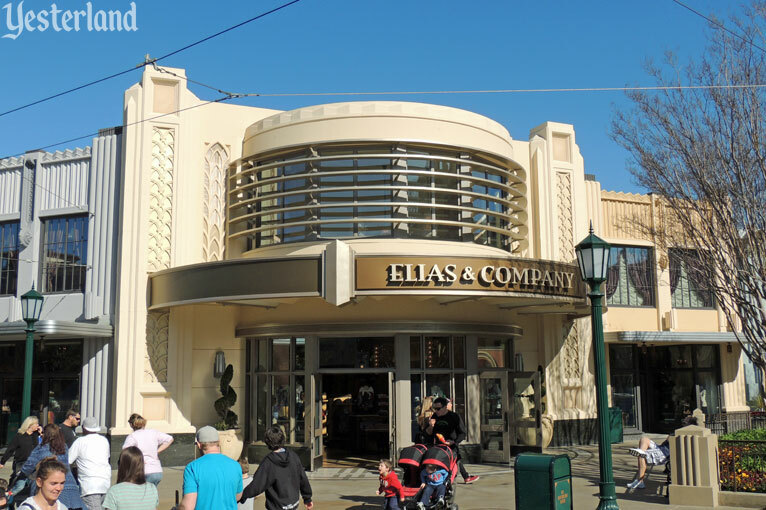 It continued to play that role until August 2011, when it closed for the transformation of the old park entrance corridor to Buena Vista Street. 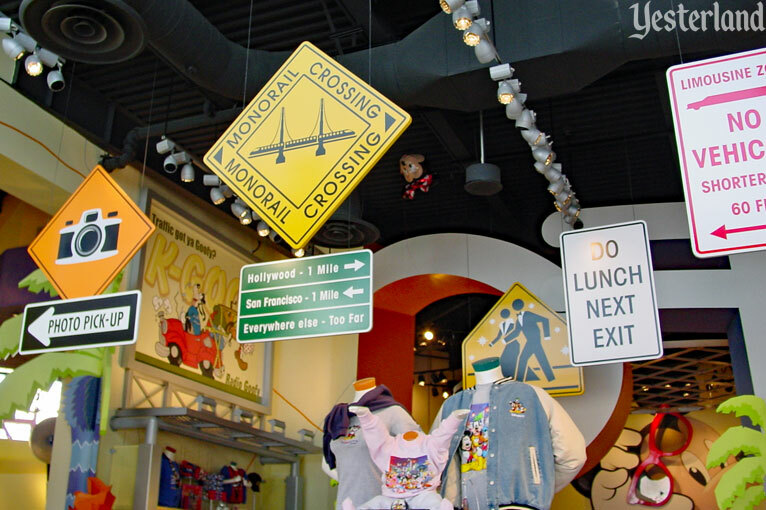 The store’s decor did not change much over the course of a decade. 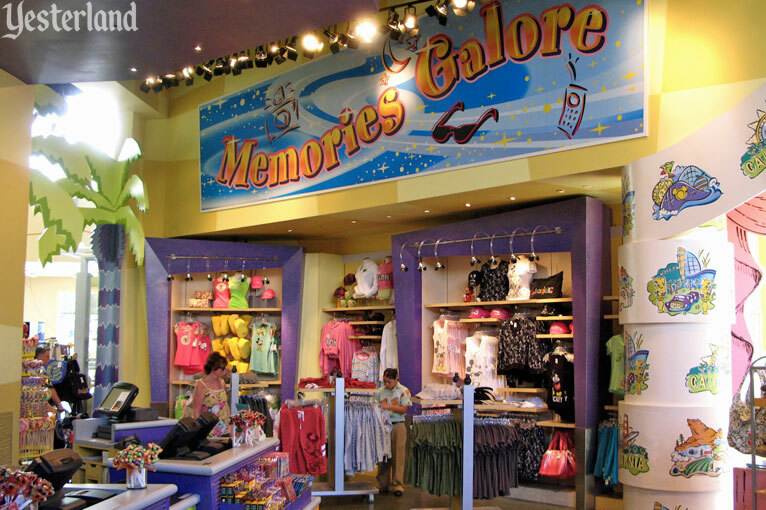 Even in its final years, some of the store’s decor was based on attractions that were gone—even Superstar Limo. 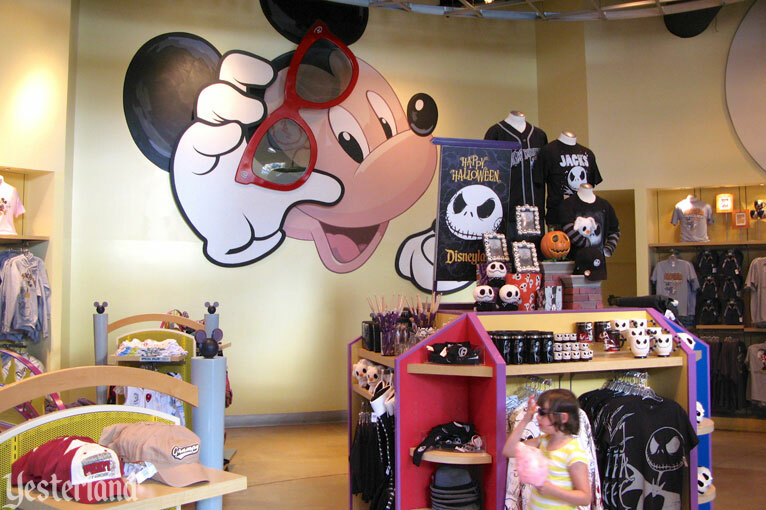 Of course, the store offered the latest “Disney Parks” merchandise and items that reflected Disney classics, current Disney movies, and Disney Channel programs. 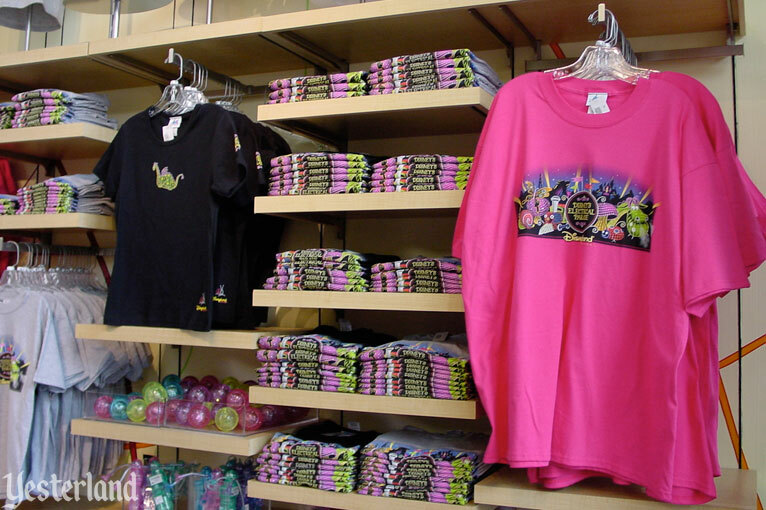 Somehow, the same items looked better in the Emporium across the Esplanade at Disneyland. 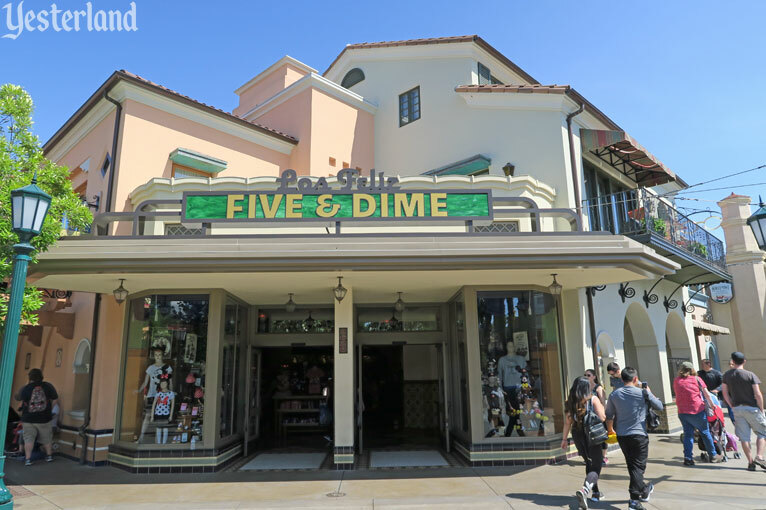 The space that had been Greetings from California and the Candy Shoppe reopened in June 2012 as Los Feliz Five & Dime, Big Top Toys, and Elias & Co.—with a lavish new interior.